avast! Mobile Security came out on top from a pool of thirty mobile security products for Android in AV-TEST’s product reviews and certifications. The testers threw over 2,500 malicious apps, including viruses, worms, and Trojan horses, at each product. avast! Mobile Security earned a score of 100 percent in detection, above the industry standard of 96 percent. But, malware protection is only part of the story. Security protection for your smartphone is no good if it eats up your battery or slows your apps down. No problem there! AVAST received a perfect score for usability which measures how much, if any, the software impacts how you use your phone. The performance of each product was evaluated by testers in three areas: 1) impact on battery life, 2) if it slowed down the device during normal usage, and 3) how much traffic it generated. avast! Mobile Security performed perfectly. Testers also looked at the number of false positives which are warnings you get during installation of legitimate software from Google Play. Again, avast! Mobile Security earned a perfect score. AVAST performed splendidly for the tests, but like I said above, malware detection is just part of the story of security protection for your mobile device. avast! Mobile Security scored extra points for a powerful anti-theft feature which allows you to remotely locate, lock or wipe your phone in case it’s stolen. It also blocks calls from specific or unknown numbers, filters messages for unwanted content, and keeps your web surfing activities safe against malicious websites and phishing attempts. Handy tools like network meter, app manager, and even a firewall give you complete control of your mobile phone. All that, and avast! Mobile Security is free. 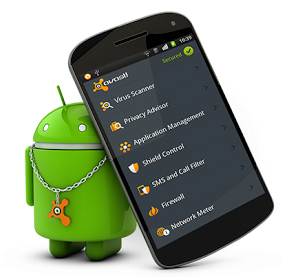 Protect your Android device and all the data on it, by downloading avast! Mobile Security for free. Get it from Google Play.